So near the end of my working day I received a notice that since I have started wearing my Fitbit (August 10th) I have officially walked for 50 miles (August 19th). 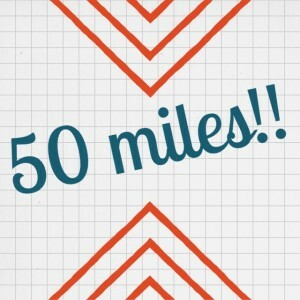 50 miles in 9 days, not too shabby. Looking forward to hitting 100 before the end of the month. Kind of amazing the amount of walking one does when one works retail. I knew it was a lot but I really had no idea that it averages out to over 5 per day. The good news is that come payday I've got at least $50 going into my pocket for spending money. The next thing I want to buy is a 3 TB hard-drive for my computer and a 64 gig memory chip for my Galaxy Tablet (birthday present). The hard drive is going to run about $110 and the memory chip probably somewhere around $50. I believe I typed it before (I've thought it, just might not have made it across my fingers). I'm going to give myself spending money based on how many miles my Fitbit tracks me as having walked. One dollar for One mile. So, the two items above are going to run about $160 which means I have to walk 160 miles to be able to buy them. After this week my next check is September 6th and I'm going to see if I can manage to get those 160 miles in before that paycheck hits. Off topic but isn't it about time you go back on AVP and give the result of that hand you posted? Of course, they will all laugh at you since EVERY SINGLE PERSON who commented said you should have folded, but you'll have the last laugh since your donkey call paid off. I didn't think that results were important. I just wanted feedback to improve my thinking and eventually my game. That's always understood. But you're not being fair to the other forum readers who now want to hear the results. You're being a prick-tease leaving them high and dry like that. You're better than that, man.